I know it sounds corny and cliché, but like most authors, the individuals who populate Becoming Jinn are not just characters to me; they are people (and Jinn—a distinct species from humans!). I talk about them like they are living, breathing entities. Many a dinner conversation over the past two years has centered on what Azra might do next. I’m thrilled that you all finally get to meet these folks who have been an important part of my life for so long. And so, without further adieu, I would like to introduce you to the characters in Becoming Jinn! As a descendant of a long line of Jinn, Azra, with her dark hair and gold eyes, has always known that on her sixteenth birthday she’d receive the silver bangle that releases her powers. And like all the female Jinn in her family, including her mother, Kalyssa, she’s now able to access the magic that lives inside her. But she’s also tied to the Afrit, the dictatorship-like council that rules over her Jinn world. She’s forced to grant wishes for humans under their strict rules and is subject to their harsh punishments for screwing up. She’s never wanted this, which has made relating to her “sisters”—the Jinn girls who will make up her Zar sisterhood—impossible. Instead of bonding with them, she rekindles a friendship with Henry, the boy who lives across the street, and gets a job at the local beach, spending her days in her favorite place in the world with a great view of the ocean—and of Nate, the head lifeguard. Balancing the human life she’s finally letting herself live with the Jinn one she’s now required to follow leads Azra down a path where she’ll discover things she never knew about becoming Jinn, and she’ll be forced to make choices about the destiny she’s meant to fulfill and the life she actually wants. With his sandy-brown hair, green eyes, and crater-deep dimples, Henry is Azra’s neighbor. Though the two grew up together, they haven’t been all that close in recent years. Azra’s birthday prompts a renewal of their friendship, and Henry’s easygoing nature, sense of humor, and desire to keep a watchful eye over Azra cement a new bond. The cute lifeguard, star lacrosse player, and soon-to-be senior who Azra crushes on despite herself has an underwear model exterior but a shy, insecure interior. With short black hair, deep brown eyes, and abs that Azra, if she didn’t know better, would think were the result of a wish granting, Nate makes Azra feel more human than Jinn. He shows her the life she could have—the only problem is, she has to hide who she really is from him. The petite Laila is Azra’s closest friend. With her blue eyes, wavy blond hair, and small stature, Laila appears more innocent and naïve than she really is. She’s sweet, generous, and fiercely loyal, standing by Azra at times when Azra didn’t make it easy to do so. Her mother, Samara, is Azra’s mother’s best friend, and Laila and Azra have been destined to follow in their footsteps since they were born. As female Jinn, Azra and her mother, Kalyssa, are both members of a Zar sisterhood. Each generation is part of a group of six female Jinn who, as tradition dictates, bond together to support each other as lifelong friends. The daughters of the Jinn in Kalyssa’s Zar become Azra’s Zar sisters. These include Yasmin, the black-haired rival with a keen ability for getting under Azra’s skin, who is the daughter of Raina; the red-haired Hana, who has a sharp mind and a knack for fashion design—without magic—and is the daughter of Nadia; Mina, the boy-crazy party girl and daughter of Jada; and Farrah, the music groupie and least talented of Azra’s Zar sisters, same as her mother, Isa. Click here for more information about the Pre-order giveaway hosted by Lori Goldstein. 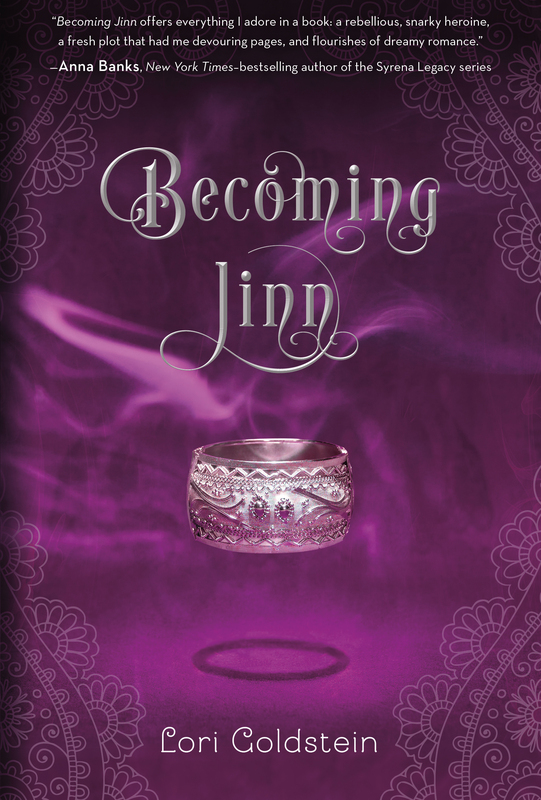 Follow the Becoming Jinn by Lori Goldstein Blog Tour and don’t miss anything! Click on the banner to see the tour schedule.